An extraordinary ARTS in Education success story. 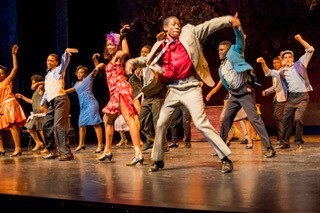 Struggling with homelessness, low-income neighbourhoods, gang-related violence and single parent households, these students broaden their education through participation in a triumphant musical production of The Color Purple that ultimately propels them into a world of opportunity they never expected. With access to the ARTS and academic mentors, our at-risk youth have the potential to break the cycle of poverty in a single generation. This three-year journey serves as an inspirational window into the lives of inner-city students who succeed at their passion while embracing the transformative power of their arts education. 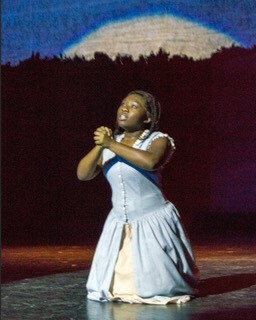 Black youth stereotypes are turned upside down in this roller coaster ride of emotions. Packing all the drama of “A Chorus Line,” the adolescent charm of “Fame” and the talent of “Glee,” you will laugh, cry and feel inspired by these amazing students. Maxine Luckett It was so uplifting and heartwarming. I watched it again in the closing block and enjoyed it just as much. Wonderful movie, wonderful stories! Nicole Schubert Purple Dreams is powerful, moving, and provides beautiful insight into the importance of arts education. Truly a special documentary. Lisa Kahan Kuba Film is phenomenal; such an important message! Congrats to Robin, Joanne and their whole team. Martin Lohrmann It was fantastic in all kinds of ways. Thanks for showing it. Barb Mozer Everyone needs to see this film. It should be shown to all educators in this country.....which includes parents! 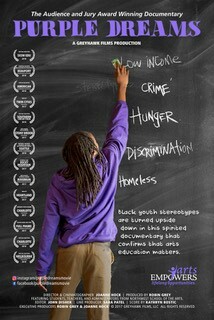 Marka Danielle This is an amazing film and it needs to be shared with school boards and legislators! Thank you!! Jill Colsch Best film I saw this year! It is all I am talking about on Monday morning. Awesome! Mindy Sink Thank you for making such an inspiring movie that shows people doing their best to make a difference.